It’s no secret I am a huge fan of Ubiquiti Networks gear. When I first installed it last year I blogged about the setup and as of today it’s still running. The only exception is I’ve upgraded the 24 port switches to 48 port units and did some cable cleanup. The fact is that this stuff runs my home office network awesome. I don’t have any lab gear connected to it either, it’s all running the network aspects of my house. It’s cloud controller based management means I can even manage other sites besides my house. 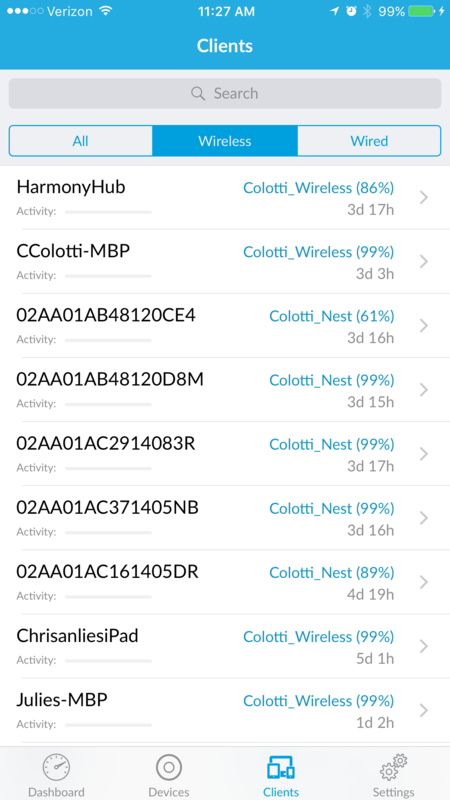 What just got better and I knew it was in the works, was the release of the Unifi iOS app. Having the controller outside the house in the cloud to have management access from anywhere was the first real win. It costs very little to runt he single Ubuntu machine that configures and manages all the sites. 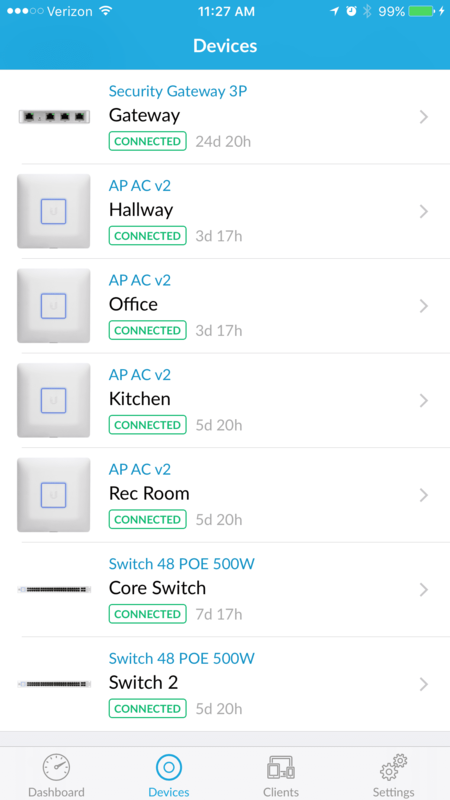 It gives me remote access to the management securely without having to connect back into the house. They have since released a “Cloud Key” and their own cloud access aggregation you can use which is great if you are just managing one location. The biggest win about the controller app is it will connect to ANY controller, internal but best of all cloud based like mine. This now means there is a mobile formatted interface for me to look at any of the sites and clients in the environment. What I have not tested is if per site administrators can get access themselves into the controller by login. It “should” work since the login screen is the same for all users and you are only presented with the sites you have access to. Below is a few screen shots of the app, but I have to say it’s awesome! 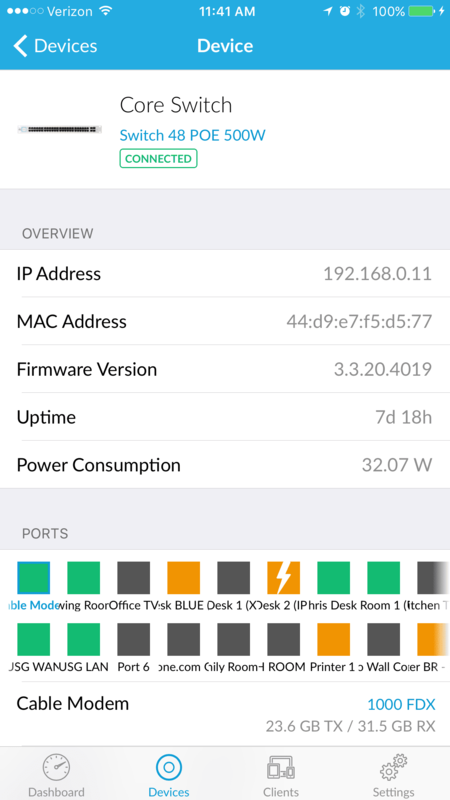 What most people don’t know is for the most part all Ubiquiti Unifi gear is software defined. You adopt new devices into the environment then push the configurations from the controller. In the case of adding access points, those will automatically provision with the wireless networks defined in the default groups. It’s pretty cool technology for the price. The only downsides of a few are simple. It does not support device rotation, which is a bit annoying especially since they were kind enough to release an iPad specific version. Also you cannot actual control the switch ports from it. You don’t seem to be able to down a port, or change the PoE configuration from it, but maybe that is coming. You don’t have full controller network configuration and VLAN setup access either, but not sure you need it. The rotation and the port based controls would be nice though. Thanks for the review! Brandon from Ubiquiti here. Yes, ability to edit settings is coming. 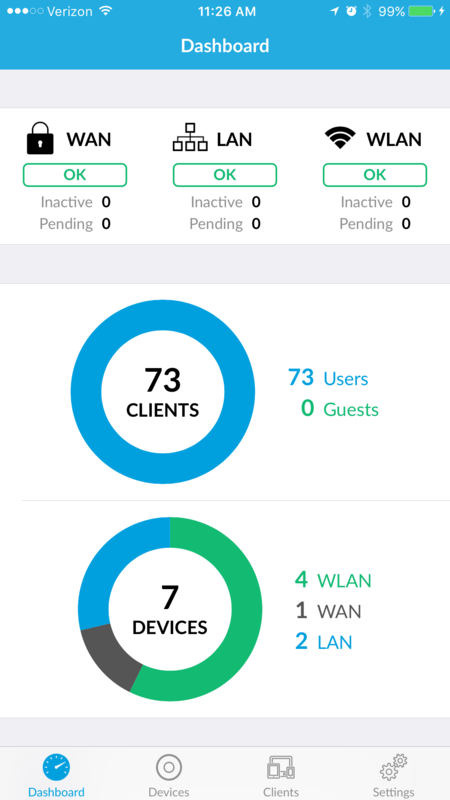 Before that we are adding the capability to list any controllers registered with your SSO account on unifi.ubnt.com. That way folks w/ say 20 different controllers can at a glance look at their status, and automatically tunnel-in (w/out port-forwarding, and w/out need for static IP or dynamic DNS). Also, we’ll fix the rotation issue. Just talked about it today. Also, feel UniFi V5 is coming soon (June 1st), which also has responsive web display (i.e. works on phones/tablets/etc. properly). 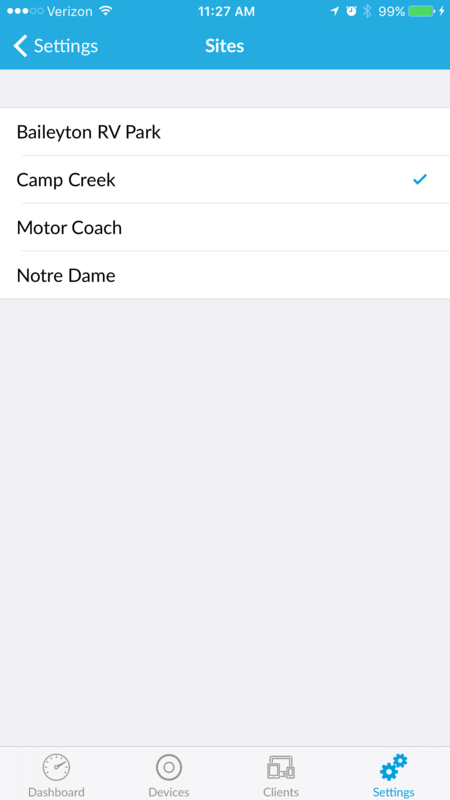 So if you ever find yourself in pinch and need to change settings from a phone/tablet (and are running V5) before the app gets the functionality – you can do so that way. I don’t think I can upload pictures here – otherwise I’d share. brandon I have heard about some of the 5.0 updates. The SSO federation is awesome. I currently use the one controller for sites I manage but I can see people installing Cloud Keys and federating them. Thanks for updating the roadmap on the federated SSO option though! Keep up the awesome work!! Love this product line! Yes, the OEM captive portal is responsive now too and will go to GA w/ V5 June 1st. For now can check in out in Beta – it’s pretty fun already – but still has some kinks in this release if you really poke at it. Oh, yes, will grab email from Mike and send away soon. I just sent you an email….send me the link to the Beta downloads….I can poke around locally on my Mac just cannot use it for my live sites. Great post, Chris. I have been thinking about switching my home network over to Ubiquiti and may finally take the plunge. I feel like the Ubiquiti stalker in this thread now. 😉 Glad to hear you’re switching over, Jason. Feel free to ping me on the UBNT forums if you need anything – I’m UBNT-Brandon there too. Noted. So we do have some CLI-digging supported. And everything is a variant of Linux. Some guys actually use our APIs to even write their own front-ends/etc. Will be curious to see what you guys find/etc. Dear I have a problem on my iphone 7 I have the Unifi app now saying that SSO login problem It is not possible to log in via SSO. 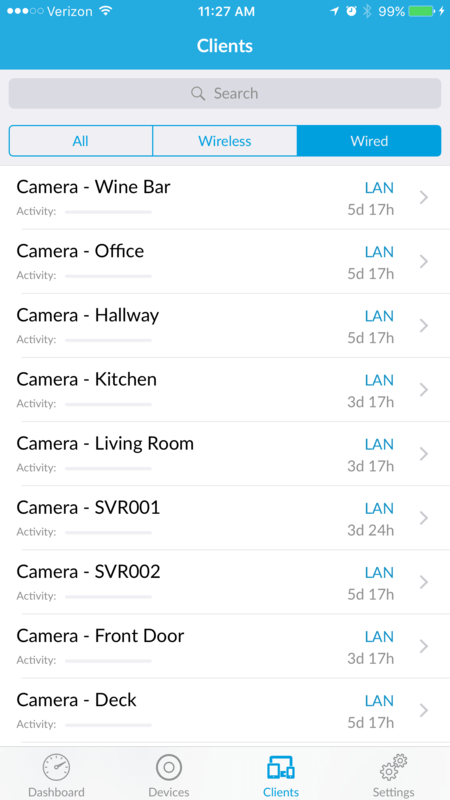 Best to post in the UBNT community forums or contact support on that one.